FireServiceRota continuously monitors the current availability of crew and warns ahead in case of (imminent) understaffing. Users know at every moment when they have the freedom to go off duty, or when they are required to remain on-call. 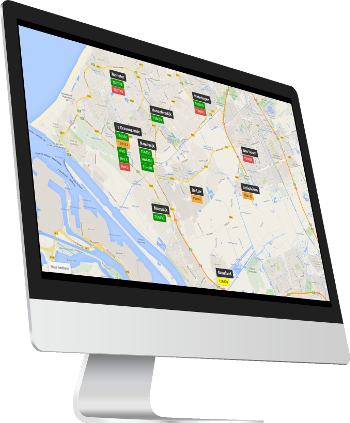 FireServiceRota also provides a real-time tactical view to supervisors, giving them insight into the resource availability of the fire station(s) under their control. FireServiceRota is flexible yet powerful: the required crew complement can vary per fire engine and time of day. Moreover, the availability of crew is determined based on their personal or standby duty rota, and team rota. Personnel can easily change their duty status at every moment via web, tablet, smartphone of pager. FireServiceRota makes this as easy as possible. For example, the recurring patterns imposed by work or the responsibilities at home only need to be entered once. 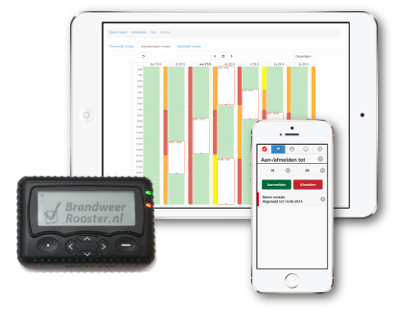 FireServiceRota gives flexibility, but simultaneously monitors resource availability: fire crew know when they have to be on-call, but also when they can safely go off duty. Sometimes a stricter form of planning is required. FireServiceRota supports the principle of 'standby-duty', in which users can make themselves available, but can only go off duty by finding a replacement. 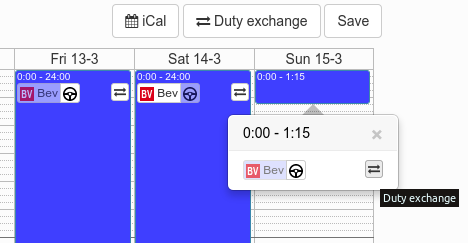 When desired, standby duty rota can be created long in advance using the integrated planning tool. FireServiceRota also keeps track of the hours during which users were on standby duty, and is able to keep a payroll based on customer hourly rates. Sharing information within a fire station is easy. 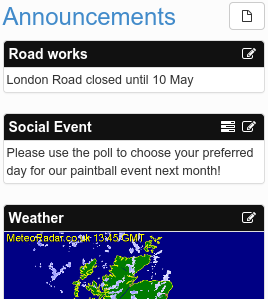 Users are efficiently informed about exercises, road works, the weather and social events using announcements. It is also possible to request their preferences using a poll. Using FireServiceRota, users can also exchange important messages via SMS text messaging, pager, email and push notifications to the smartphone. Larger fire stations often work with teams that work in shifts. 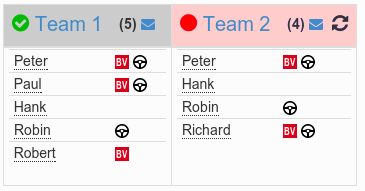 A team can crew different vehicles at different times. Moreover, users can temporarily complement a team, or leave it. All this is easy to achieve in FireServiceRota: the system supports even the most complex team rota or multi-week recurring shift sytems. At the same time it remains easy to maintain insight into which teams and which users are available at any time. Click on the red/green indicators for more information. This video shows a short demonstration of crew confirmation after the on-call crew is informed of an incident. Immediately after the on-call crew is alerted via pager, all available users are requested to confirm their ability to respond. After about 20 seconds, the first users confirm they are mustering. Users who rejected the call are shown with the icon , while users that have confirmed are shown with the icon . The position of the users who have confirmed are shown on the map (if they have permitted this) with their expected time of arrival at the fire station. Immediately after the pagers goes off, the on-call crew is requested to confirm their ability to respond. This can be done via smartphone or (smart) pager. The display in the fire station shows who is en route to the fire station, and what time they will arrive. In doing so, availability confirmation gives extra assurances that a full crew complement can be achieved when the pager goes off. A geofence is a “virtual geographical fence” around the station that ensures on-call firefighters are close enough in case of an emergency. Firefighters outside the fence are automatically considered to be off-duty. When on-call, firefighters are warned if they accidentally move too far from the station. They can then either go off duty or return to the geofence of the station. FireServiceRota is compatible with several models of smart pagers. These pagers provide two-way communication to provide FireServiceRota's main features, such as confirmation of attendance, geofencing, and changing availability. FireServiceRota can make an automatic incident report based on the message received on the pager. This includes who was on-call when the incident occurred, the address, the priority and the confirmed attendance. Upon returning to the fire station, the actual role allocation can be entered. After this, the report can be printed or sent electronically to an (external) incident management system, saving paperwork. 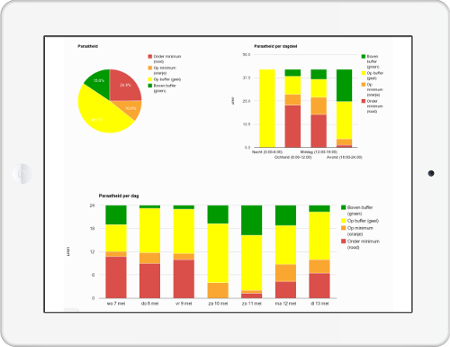 FireServiceRota provides insight at a glance into the historical availability of resources. 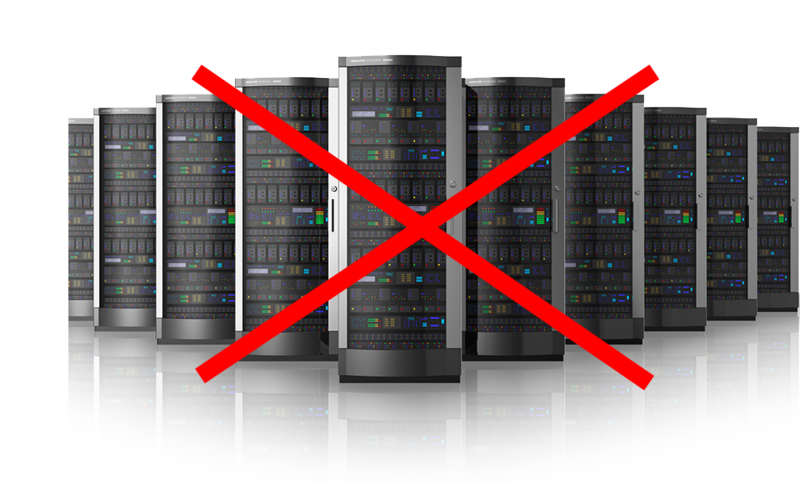 Powerful reporting tools help to identify recurring availability problems. 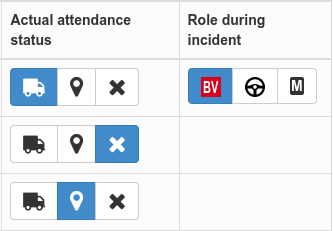 For example, it is possible to visualise readiness per day, skill or vehicle. In doing so, FireServiceRota supports decision makers in being continuously vigilant to improve resource availability. 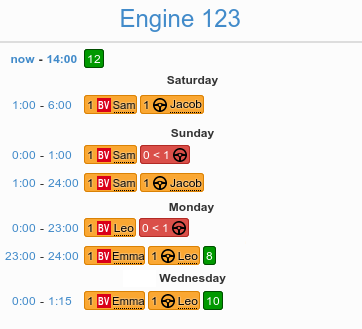 FireServiceRota shows real-time resource availability of one or more fire stations of a region on a single display. Regional Monitoring allows Fire authorities to have a tactical overview of the readiness of their area and provides insight into historical records of availability. 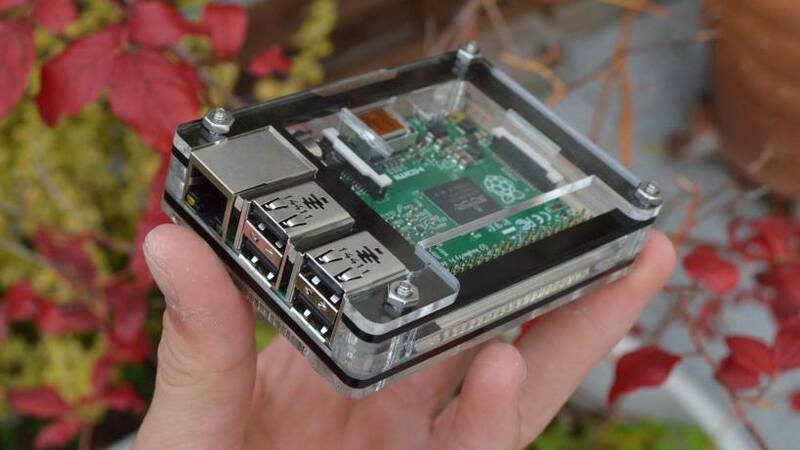 The Raspberry Pi is a small PC that can turn any screen into a station or region monitor display, without the hassle of having to install, configure and maintain a PC. Mount it behind a flatscreen TV in the fire station to display the current status of the station, and get real time information about staffing, announcements, incidents, and more. FireServiceRota is built with openness and transparency in mind. We can easily build integrations with other systems, such as HR and incident management systems, in order to avoid manual input and prevent errors. FireServiceRota also has an XML/JSON API for retrieving reports, user data, rosters, etc. Of course, data is protected and secured with the latest security standards. 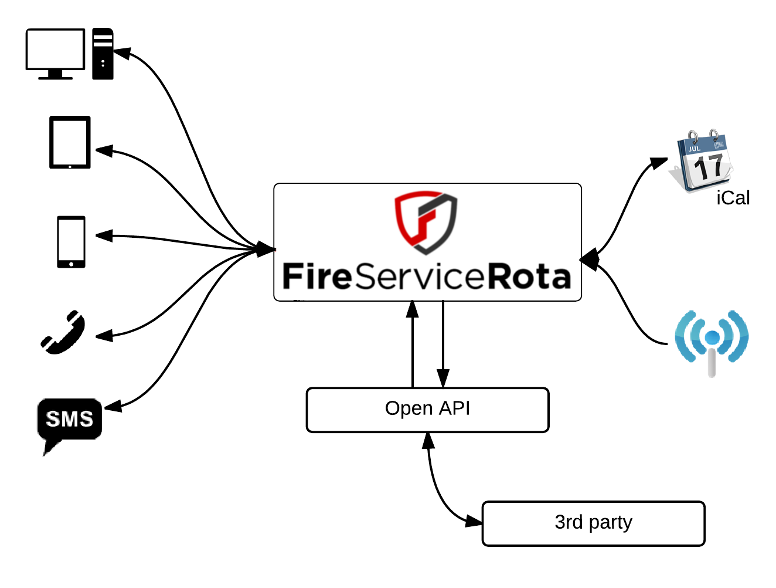 FireServiceRota is software that runs on the internet. All you need is a browser and an internet connection. You pay a monthly fee, and FireServiceRota provide regular software updates and technical support to ensure servers are maintained, secure and backed up with 99.9% uptime reliability. Is FireServiceRota suitable for my fire station?